As a thank you to customers who place an online order of $25 or more through me, I will now include a free project tutorial PDF with your order. The PDF file will list all supplies, measurements, and step-by-step instructions with photographs to make your project. 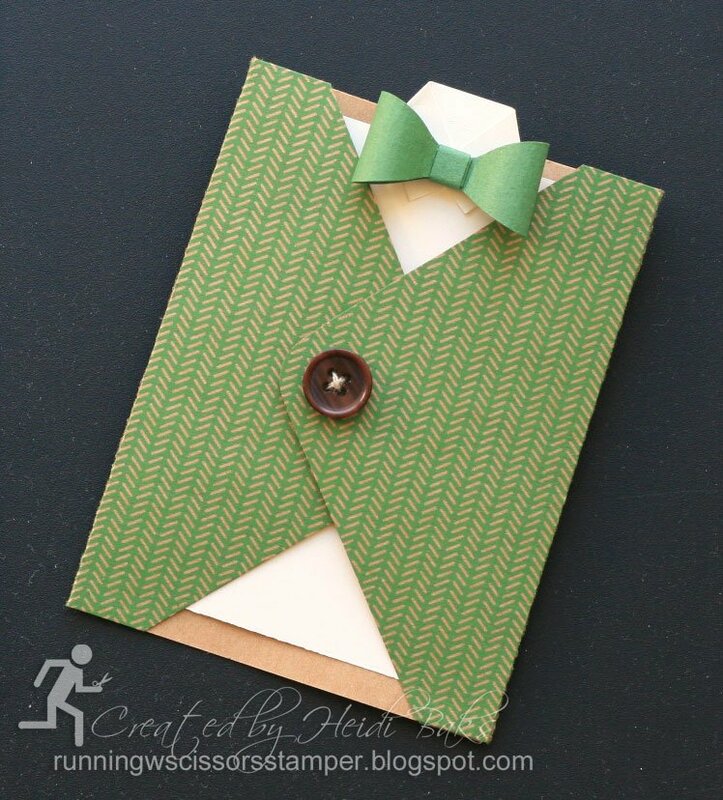 The featured project will change monthly and will be emailed separately to the contact address on your order. 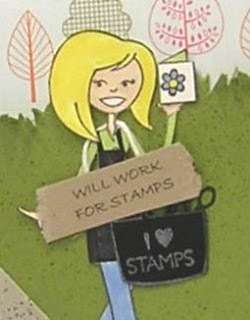 Offer valid for U.S. customers only. 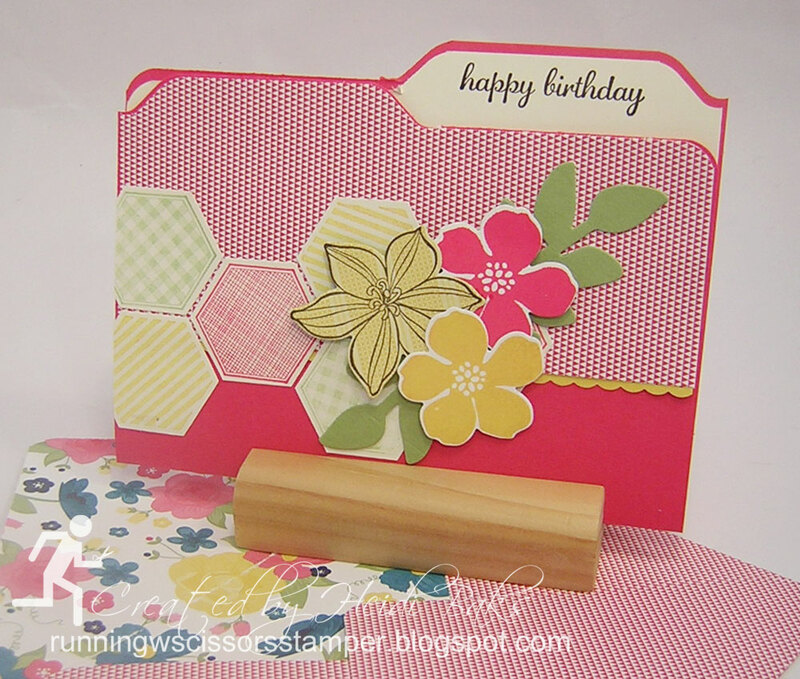 With your online order, rather than the latest project of the month, you can choose any other tutorial. 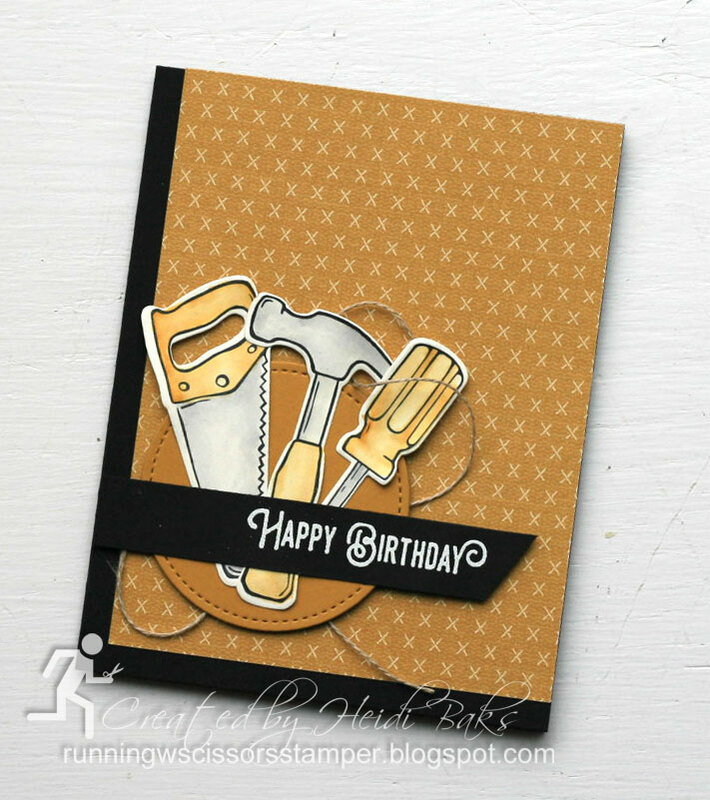 Please contact me if you have an alternate choice at runningwscissors@earthlink.net. 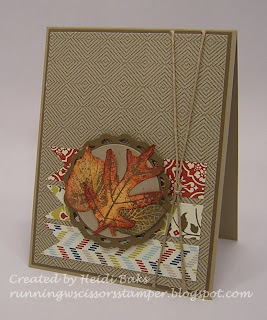 April/May 2014 Make & Take: The popular file folder card. 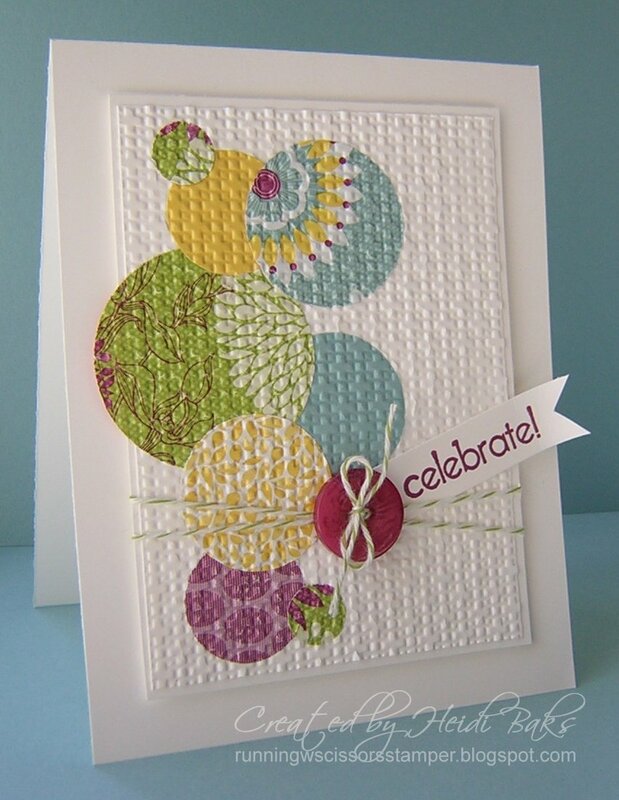 March/April 2014 Make & Take: A fun starburst technique plus a cute clay button. 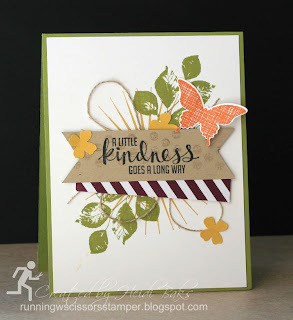 Just add a sentiment! 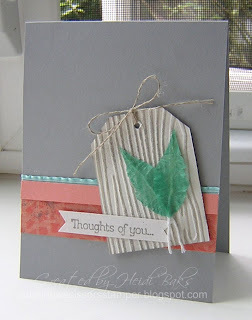 January 2014 Make & Take: Love the words from the Expressions framelits? 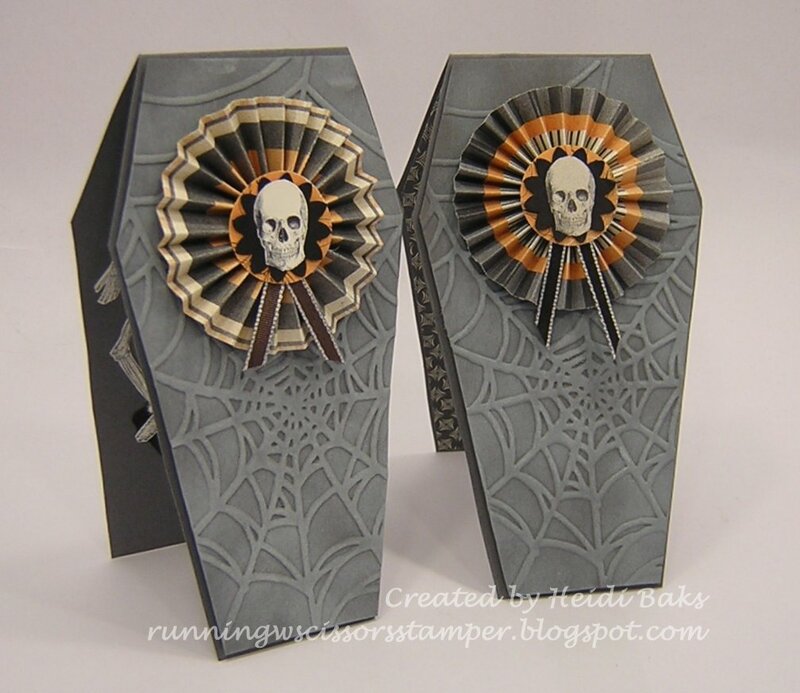 Well, unfortunately they aren't available any more, but this make & take is! 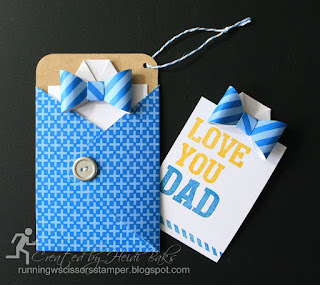 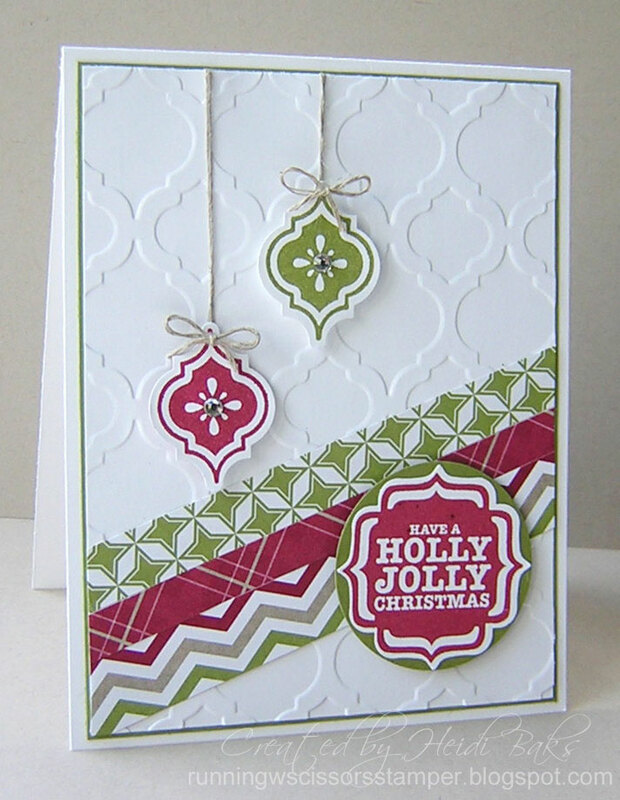 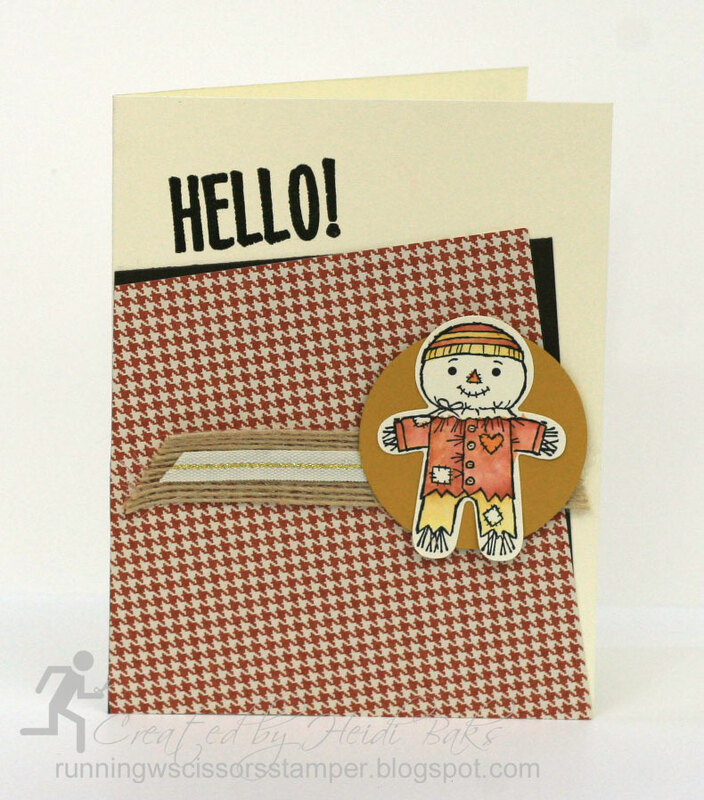 December 2013 Make & Take: A mailable card with bold, trendy colors and shapes. October 2013 Make & Take: Celebrate fall with this sparkly and colorful leaf card. 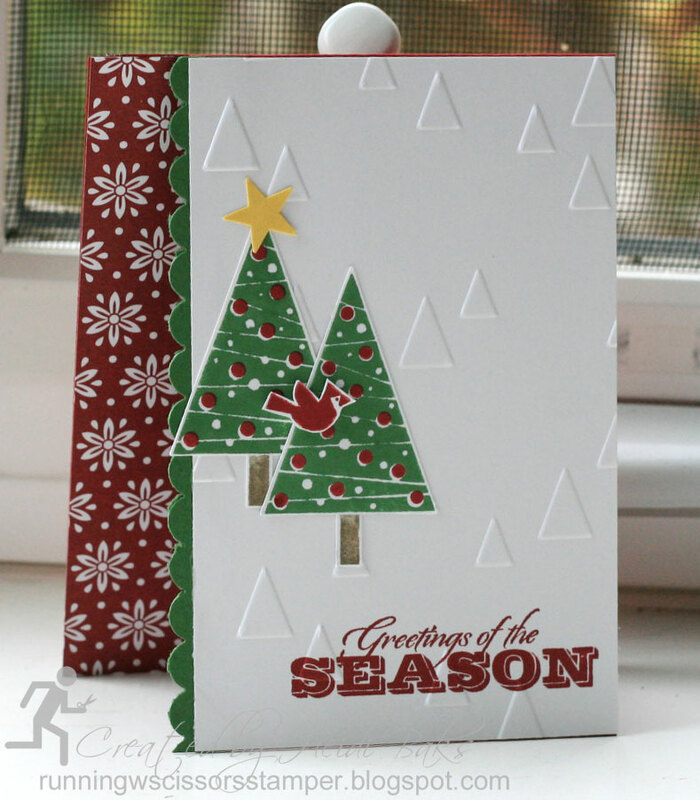 September 2013 Make & Take: Just in time for the start of Christmas card-making season, this make & take is a quick and easy festive card to put together. 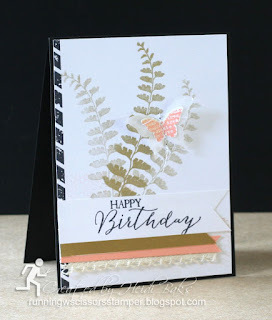 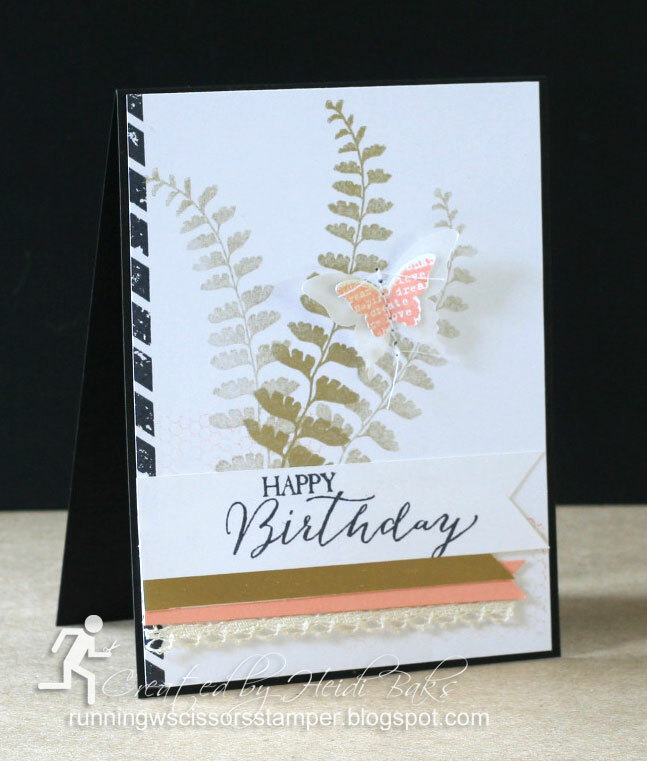 July 2013 Make & Take: I love this simple, yet stunning, feather card. 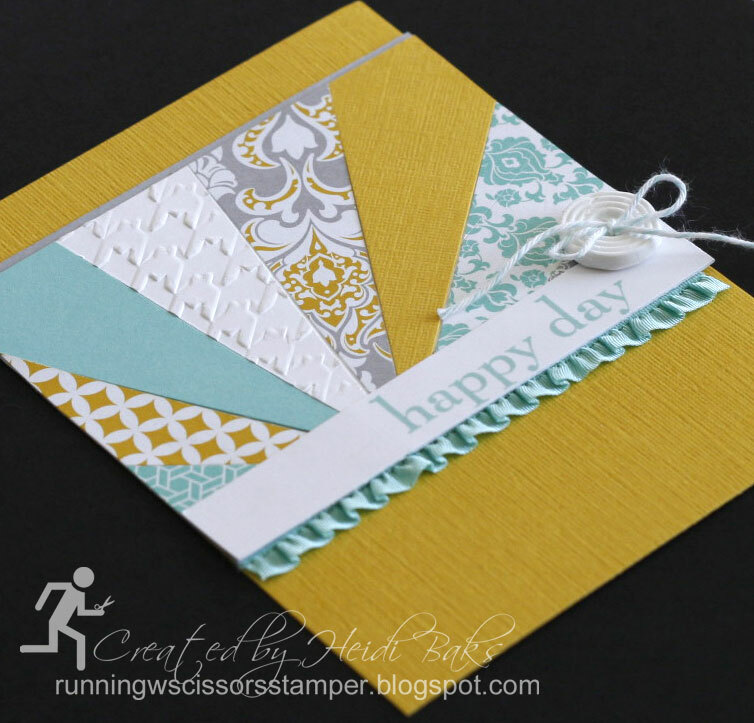 The color combo, from the Friday Mashup, was just fabulous! 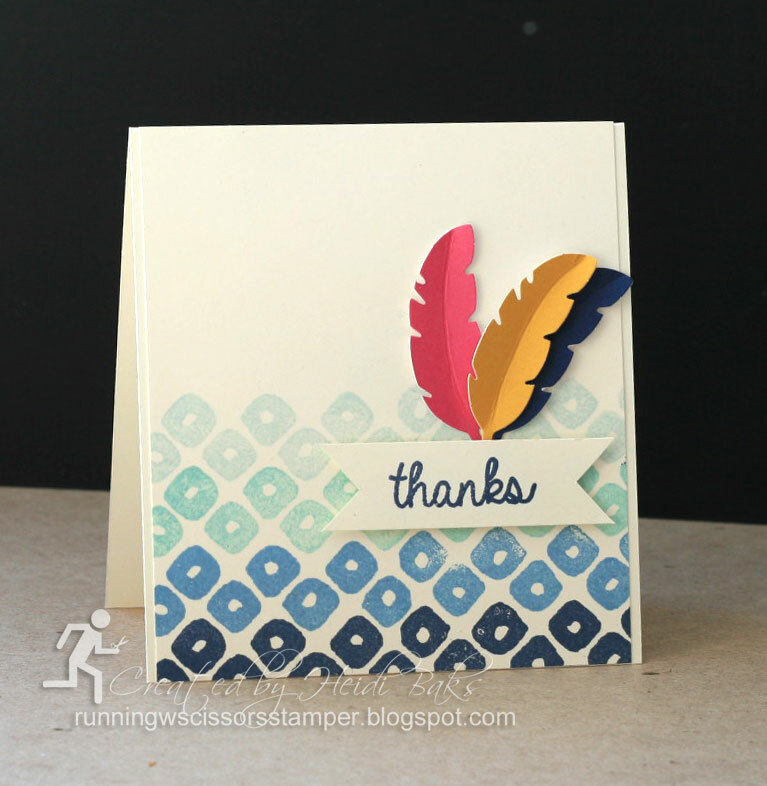 Just add your favorite sentiment. 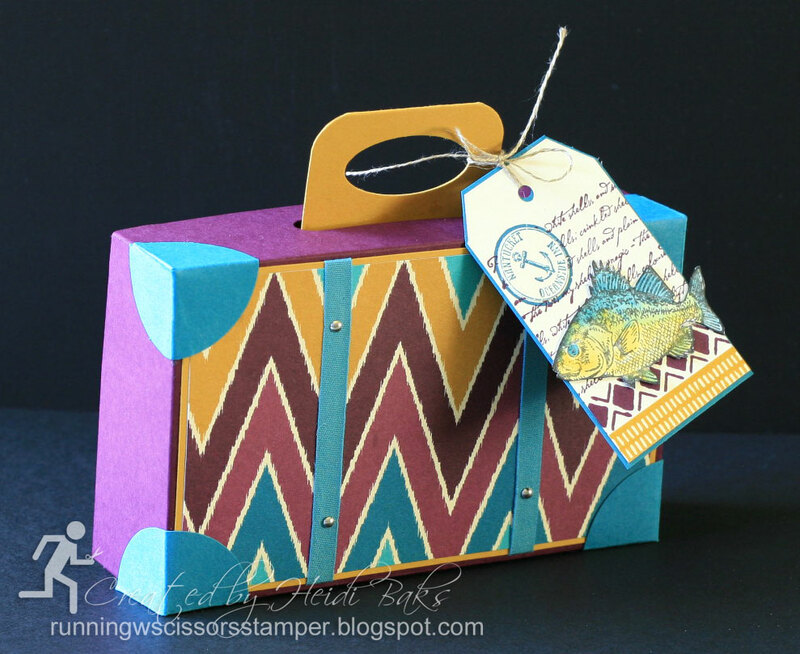 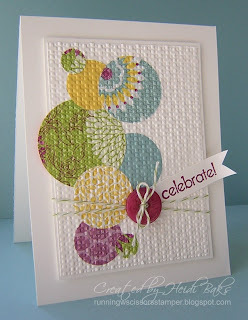 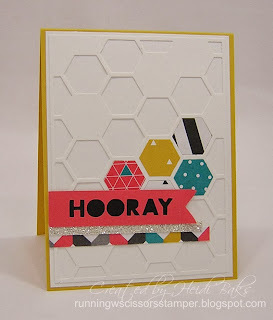 April 2013 Make & Take: This take on Jen Timko's happy and fun birthday card is perfect any time of year. 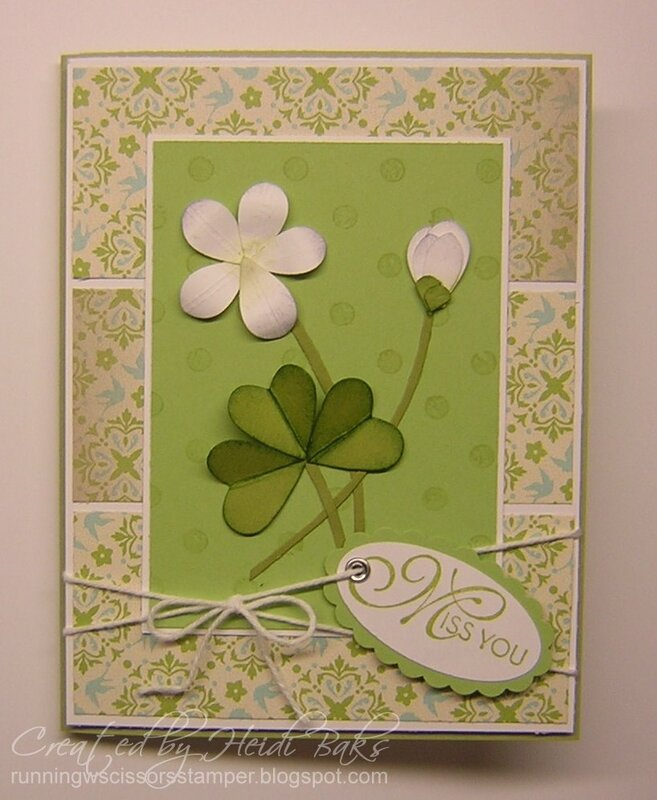 March 2013 Make & Take: This Going Green card would be perfect for St. Patrick's Day or any occasion. February 2013 Make & Take: Valentine's is coming! 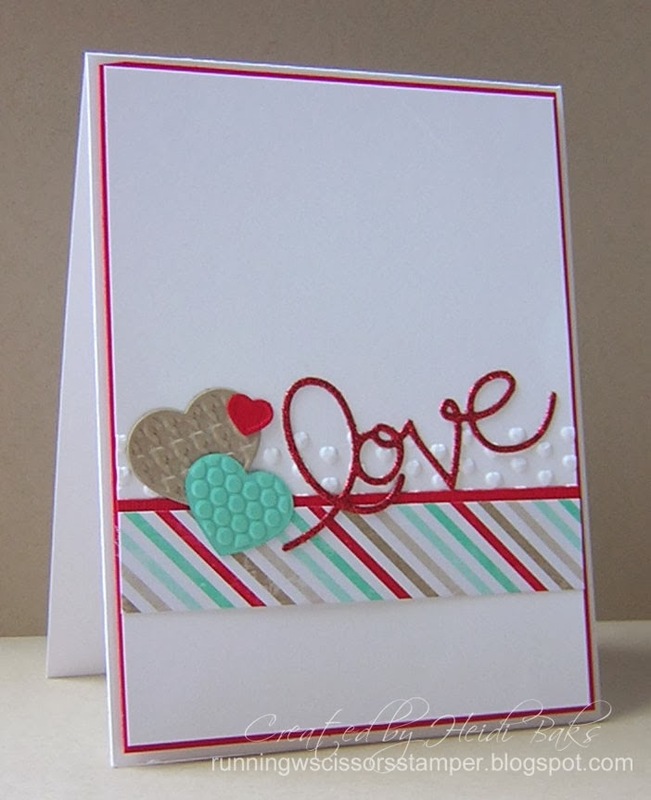 What a perfect way to say "I love you" with a beautiful layered heart card. 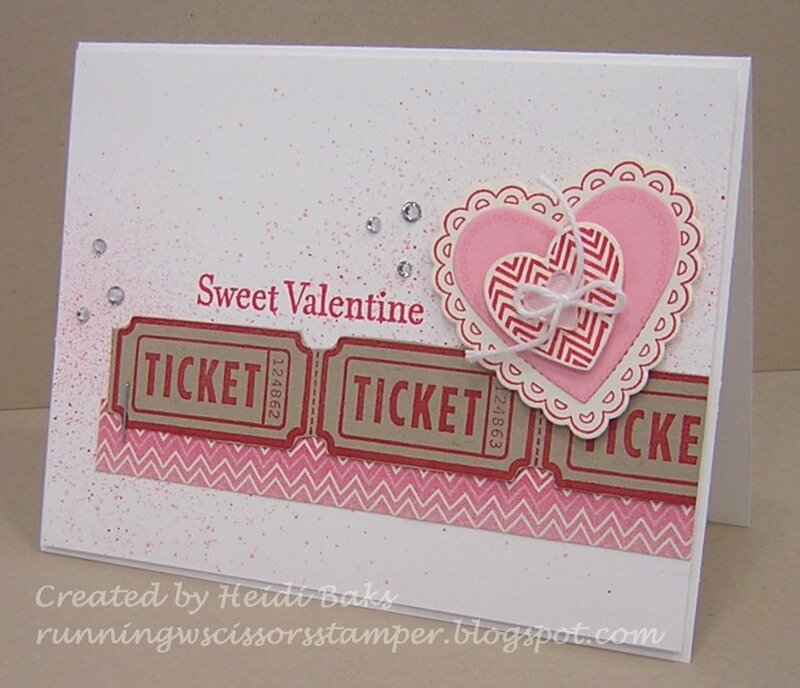 By adding your own sentiment, you can use this card for more than Valentine's. 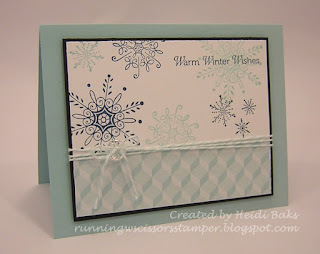 Late December 2012 / January 2013 Make & Take: A warm winter card, perfect for January. 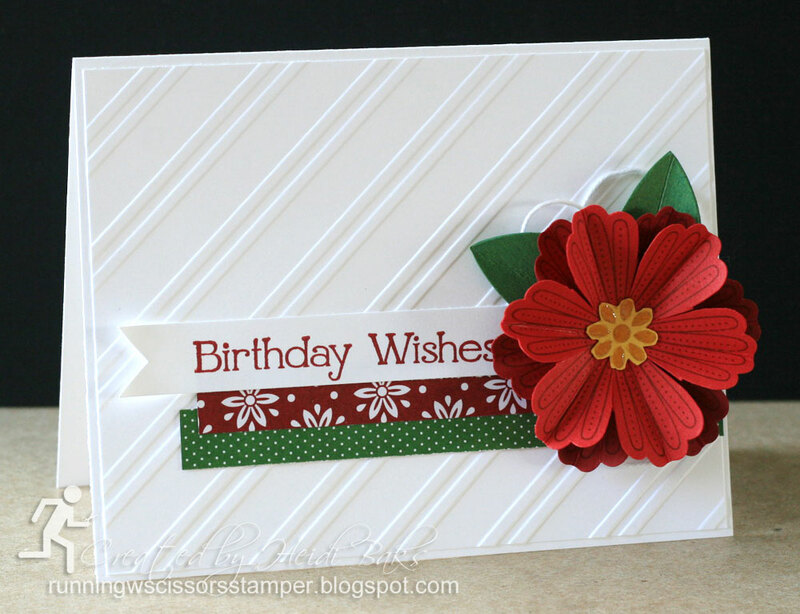 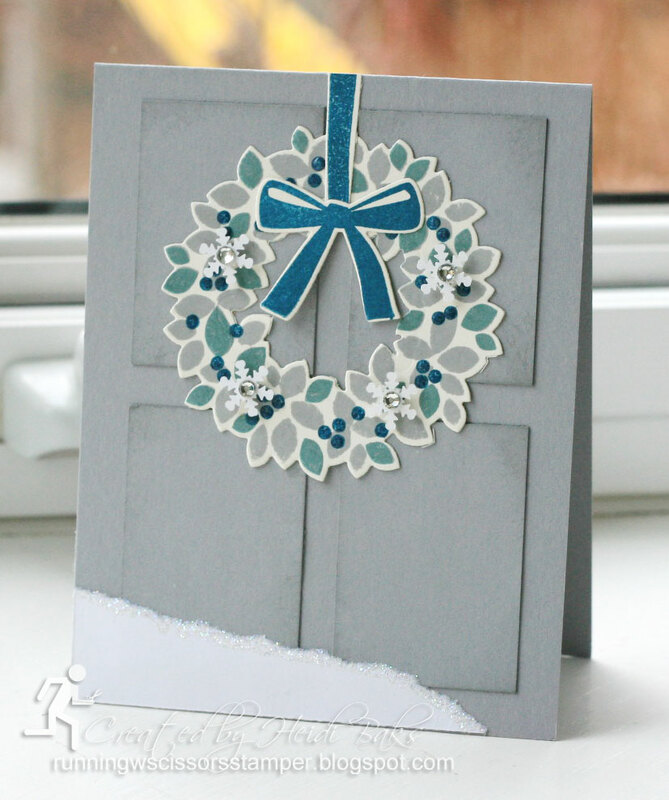 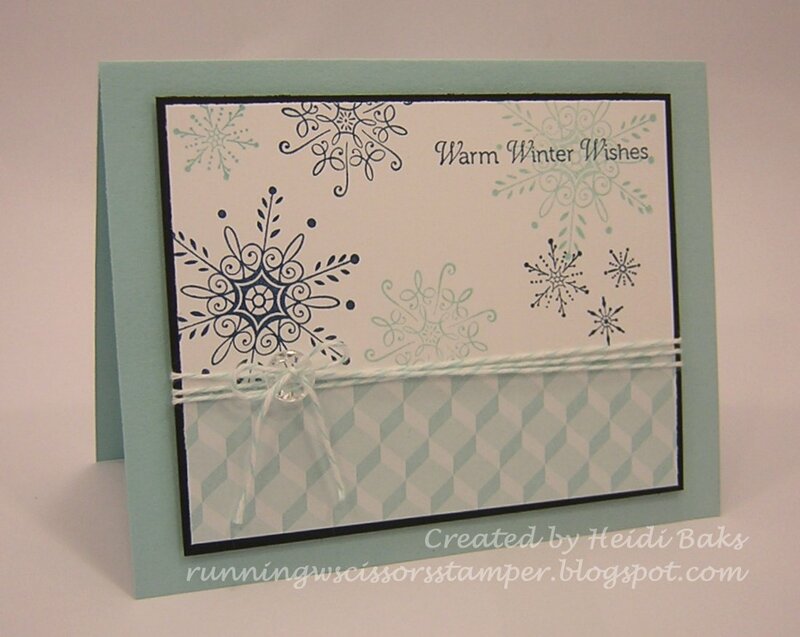 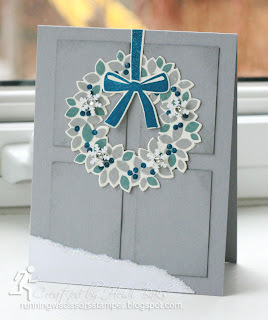 This card uses the retired set Serene Snowflake, but Snowflake Soiree from the Holiday catalog can be used as well. 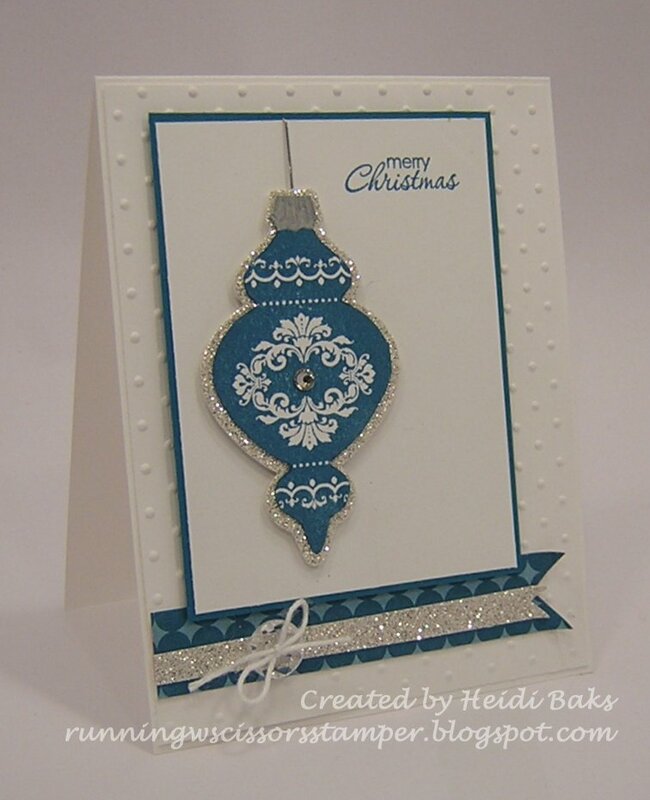 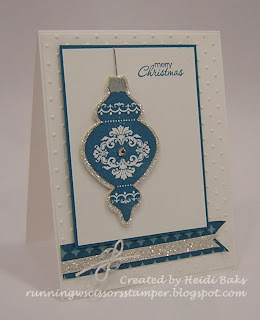 December 2012 Make & Take: A sparkly and festive blue ornament card, designed for use with stamp sets Ornament Keepsakes and Petite Pairs. 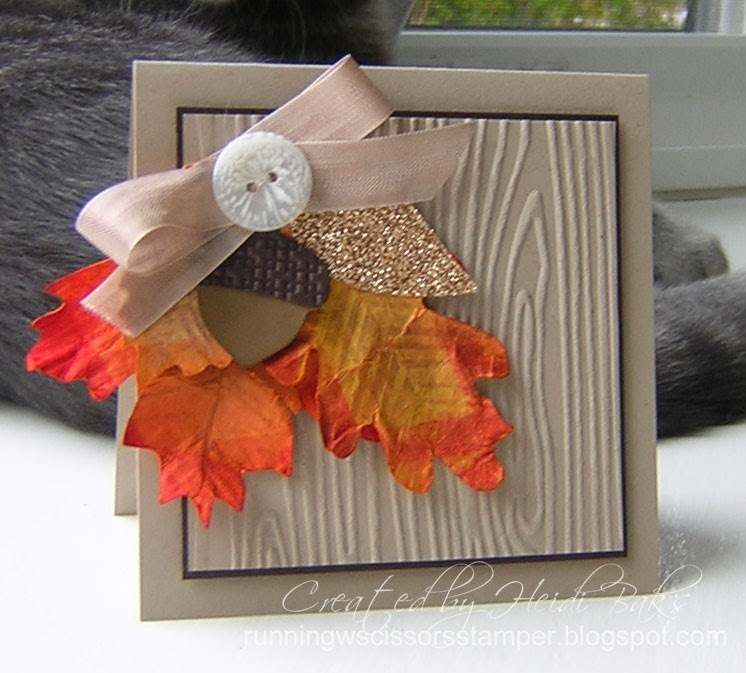 November 2012 Make & Take: A beautiful Fall or Thanksgiving card. 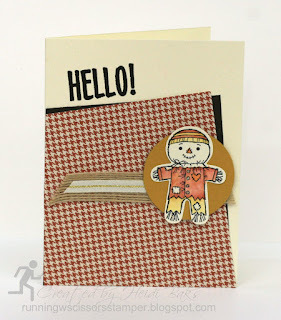 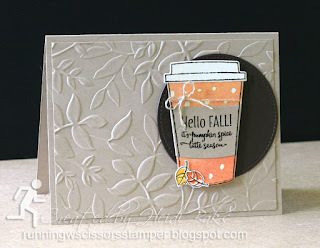 I will be including die-cut leaves using the new Autumn Accents die from the Holiday mini catalog. 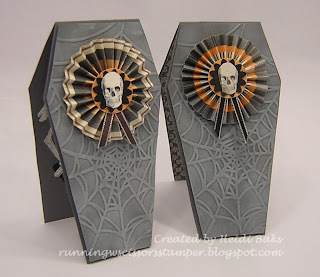 October 2012 Make & Take: A ghoulish and fun coffin card with a surprise skeleton inside! 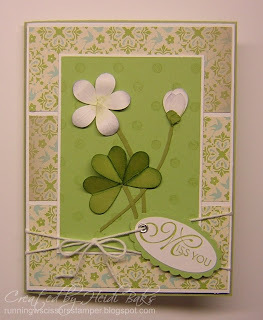 Here's my original post on this fun card. 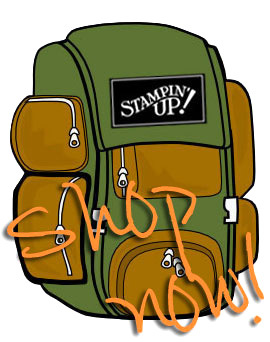 I hope you enjoy this new perk as a loyal customer.